In the 1950s, North Carolina was in crisis. Ranked 49th in the nation in per capita income, the state was a Southern economy dependent on tobacco, textiles and furniture. University graduates were leaving the state in droves in search of better jobs. The future looked grim indeed. But then-Governor Luther Hodges, working with leaders of government and industry, fashioned a bold solution. Out of thousands of acres of pine forest, they imagined the creation of a research park to be the engine for a new economy. 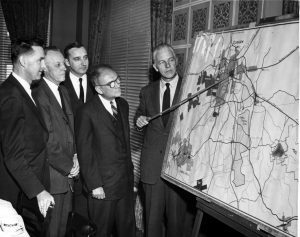 He secured the cooperation of Duke University, North Carolina State University, and the University of North Carolina at Chapel Hill, the three institutions that would form the geographic boundaries of what would become The Research Triangle Park. Hodges tapped Archie Davis, the first president of the Research Triangle Foundation, to raise the capital to make it happen. Davis famously traveled the state raising money from rich and poor alike to acquire the land for the Park. Through his donors’ generosity of spirit Archie Davis created a special legacy: that the Park be run forever as a private not-for-profit. 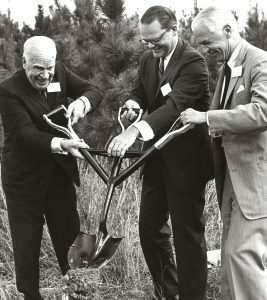 At the time, RTP was America’s second university research park (Stanford’s was first), and the first shared endeavor in which universities partnered to commercialize technology. 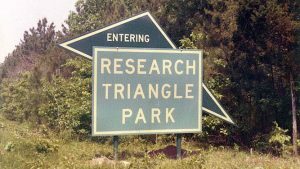 More than half a century later, RTP remains North America’s largest and, arguably, the world’s most successful research park. It has become a model and has been the focal point of countless attempts at replication. The first five years of RTP’s existence were relatively slow. 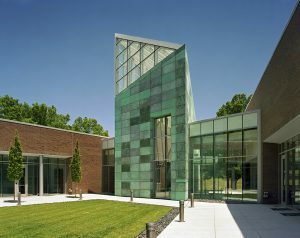 The Research Triangle Institute (now RTI International) was the Park’s first tenant. Founded by the three RTP partnering universities and local business leaders, RTI took on government, university, and private corporate research projects. Chemstrand, the company that invented Astroturf, came next to RTP. 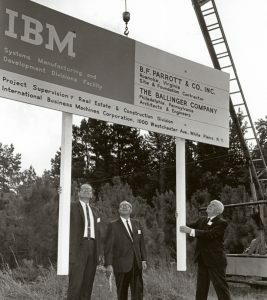 And then, in 1965, IBM announced that it would build a 600,000 square-foot research facility in the Park for its new 360 computer. 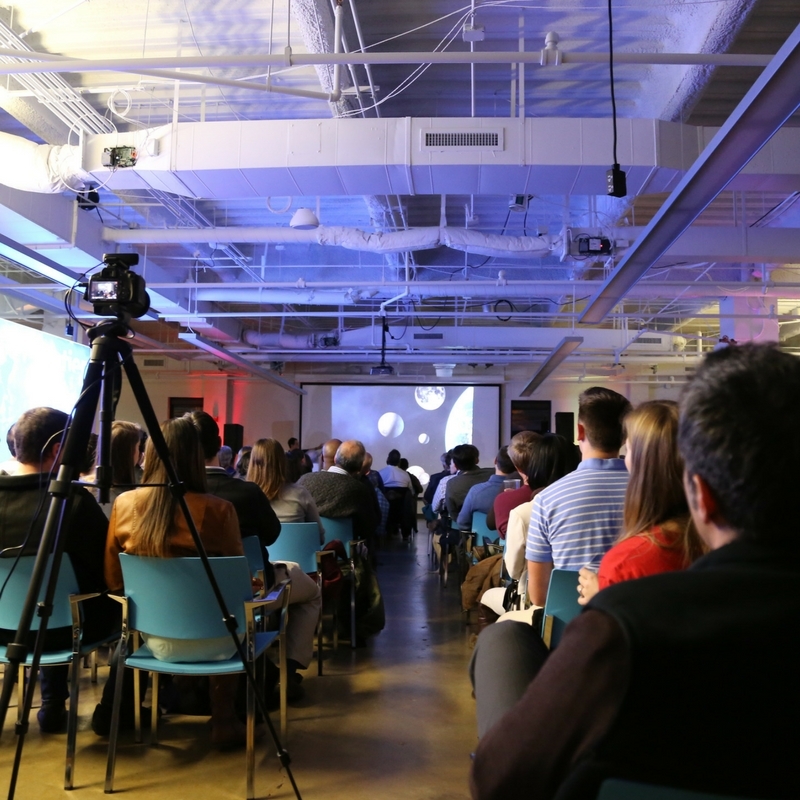 From this point on, the word was out—RTP was a great place for emerging research and technology companies. There was untapped talent available at the local universities, and an intelligent culture and affordable cost of living that the employed scientists and technologists loved. 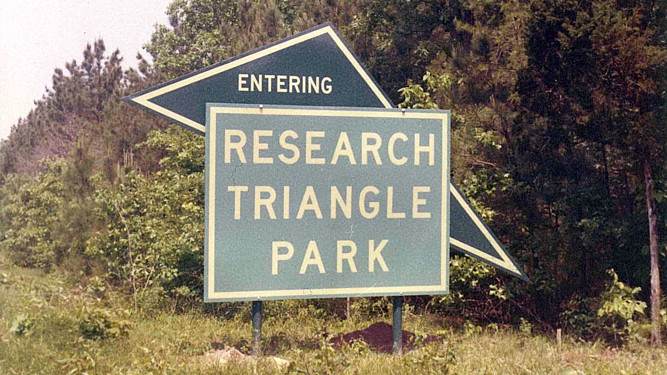 By the end of the decade, 21 companies had established research facilities at RTP. By the end of the 1970s, 17 more entities—including Burroughs Wellcome, the US EPA’s largest research laboratory, Northern Telecom, and the National Humanities Center—had moved to the Park. In just two decades RTP had become an engine for regional growth and transformation; its growth rate would continue to accelerate even further. Additionally, around this time, the region was impacted by a business shift toward the outsourcing of contract research and clinical trials. RTP’s collaborative model once again figured prominently in the CRO success: many drew heavily on the statistical and analytical expertise at the Triangle’s university partners—Duke, NC State and UNC—and also North Carolina’s home-grown firm, SAS. Following the merger of Glaxo-Wellcome and SmithKlineBeecham, 61% of entrepreneurial spawns specialized in new drug discovery and medical device development. 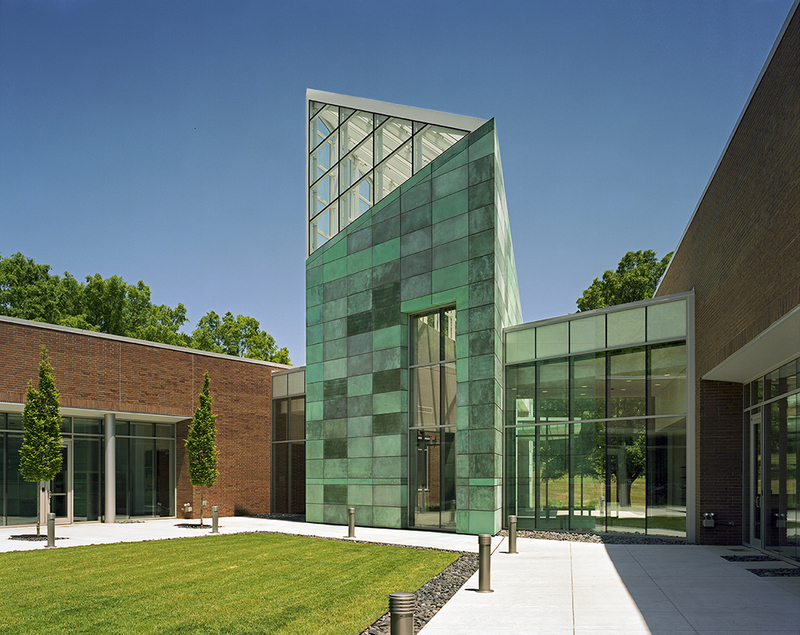 During this same period, the Triangle’s collaborative model added two important components—the NC Biotech Center and the Microelectronics Center of North Carolina. These organizations were the nation’s first state-funded non-profits that promoted small firm success in the life sciences and microelectronics. The state’s hands-on policy of loans, grants, counseling and networking worked: North Carolina today ranks among the top three states in bioscience employment and has become a world leader in vaccine research and manufacturing. It is home to a $86 billion a year agricultural biotech industry that will play a major role in feeding a world population expected to reach nine billion by 2050. UPC Barcode and Scanner—Developed in RTP by IBM, these technologies revolutionized how inventories are managed and controlled. Today barcode technologies have become a $17 billion business. Taxol Anti-Cancer Drug—This drug has saved the lives of hundreds of thousands of cancer patients. 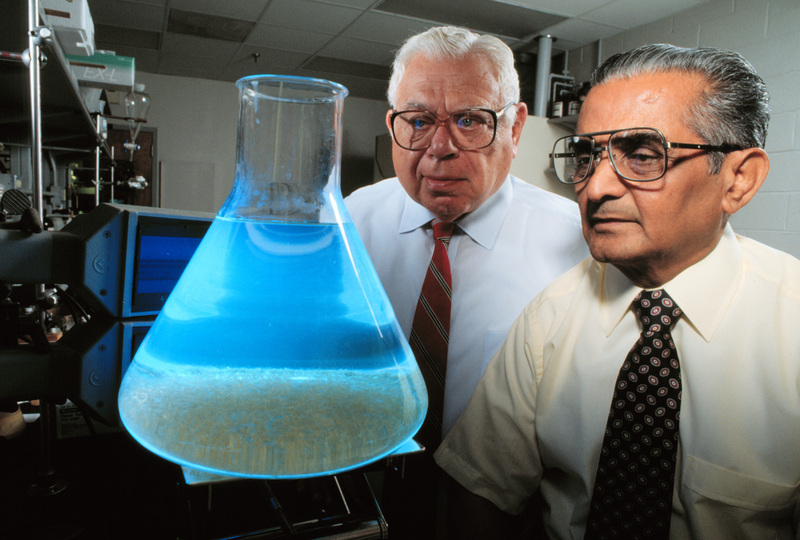 It was developed by two scientists at RTI International and is the most prescribed cancer drug of all time. AZT (Azidothymidine)—The first drug to substantially improve the quality of life for HIV/AIDS patients was developed at Burroughs Wellcome in the Park, work for which the scientist was awarded the Nobel Prize. Many other innovations from RTP with near-universal impact could be cited, including: the on-board plane wind shear warning developed at RTI that has saved countless lives and industrial LED lighting by Cree that has reduced energy consumption worldwide. These innovations represent a small fraction of those developed at RTP. 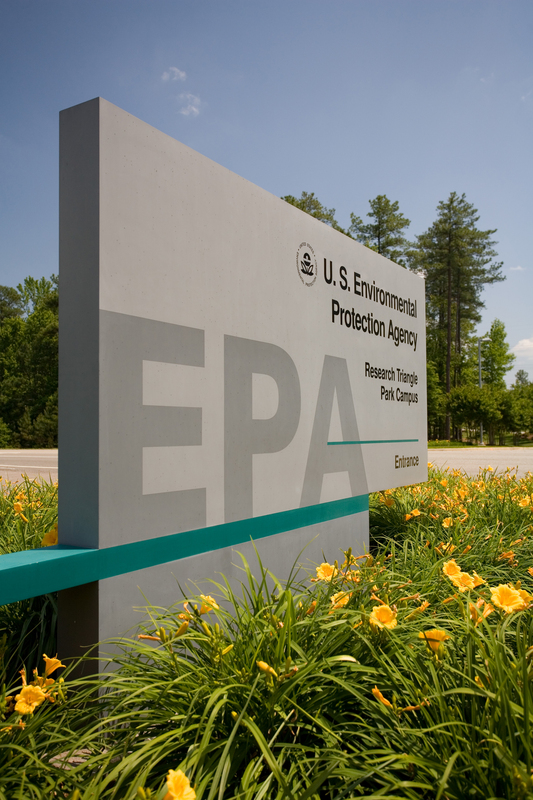 Since 1976 RTP entities have received over 3,700 patents. Collaboration between RTP companies and the surrounding community is standard operating procedure. Members of the UNC faculty have taught IBM management teams, while IBM funded the robotics lab at NCSU. The proximity of the Park is a major factor in enabling RTP’s university partners to attract research dollars. Today, the three universities bring in $3 billion in research funding annually. Those dollars support 10,000 jobs at UNC alone, and 20,000 jobs overall. The success of RTP and its university partners has led to developments the founders of RTP could not have dreamed of. One is the NC State Centennial Campus, the university’s own 1,000 acre research park in Raleigh. It began to take shape nearly 40 years ago and today has over 70 corporate, government and non-profit research partners. And on another point of the Triangle, the American Underground in Durham has now become an incubator for over 250 high-tech startups. The Underground has been a Google for Entrepreneurs Tech Hub since 2015, and its companies have raised over $27 million. But RTP, long known as the home to massive multinational corporations, has quietly grown its own entrepreneurial community. Currently, more than 60 percent of the companies located in Research Triangle Park have 25 employees or less. The rise of small firms over the past three decades has added energy, vitality and creativity that hold great promise for the Park’s future. It often leads to partnerships with larger firms in the Park. The key is flexibility and resourcefulness—attributes that have long been emphasized by firms at every size level in RTP. Almost 60 years into its history, RTP isn’t resting on its laurels—its leaders are thinking about to continue cultivating cutting edge innovation for another 60 years. 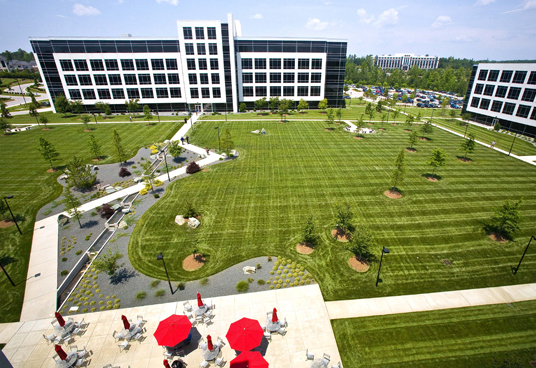 In 2014, the Research Triangle Foundation announced plans to reinvent the Park—to transform RTP from a landscape dedicated exclusively to corporate research campuses to a mix of highly collaborative, amenity rich innovation nodes—areas where workers can live, work, and play and visitors can interact, engage, and be inspired by the technology being created in the Park. One of these nodes is located in the center of Research Triangle Park. Called Park Center, this 100-acre parcel is currently the only land within RTP with zoning that allows for office, retail, hospitality, and residential uses. A smart, denser district is planned with almost 2 million total square feet of real estate to be developed—this will include over 600 residential units, up to 1 million square feet of office space, restaurants, retail, and over 7 acres of parks. The site also includes existing buildings, some of which have already been repurposed into a testing ground for ideas surrounding the reinvention of suburban research parks. These buildings are called The Frontier campus. Located in a cluster of former IBM office buildings built in the 1970s, The Frontier is been retrofitted and transformed into something almost unrecognizable. Free coworking space and meeting rooms encourage collaboration. Small, private offices and wet lab space with flexible and affordable lease terms provide entrepreneurs and startups opportunity to grow and collaborate. 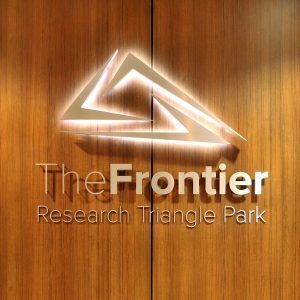 And daily events and programming have helped The Frontier become an open, creative, community hub that has seen over 300,000 visitors since it opened in January 2015. 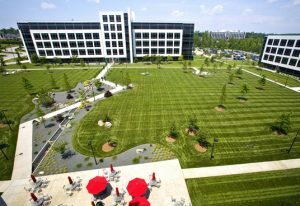 By offering these new inspiring amenities, RTP is continuing to attract and retain leaders in science, technology, and business. RTP currently has 264 companies that employ almost 50,000 talented workers. This community has inspired scholars like Brookings Fellow Antoine Van Agtmael to call RTP one of “the smartest places on earth.” 50% of the population in RTP’s surrounding counties have bachelor degrees, and nearly 1 in 5 have a graduate degree. When all is said and done, the greatest single contribution RTP has made to national economic, social and environmental well being is the model itself: it has proven over and over again that collaboration and cooperation can succeed. Moreover, the litany of successes achieved year after year at RTP provide emphatic proof that enlightened public investments can lead to spectacular returns. In a sense, this has been the Research Triangle Foundation’s gift to the nation: that modernization can be achieved through committed leadership and sound public investments. We believe it is a lasting legacy that many others can draw on and build on for many years to come.